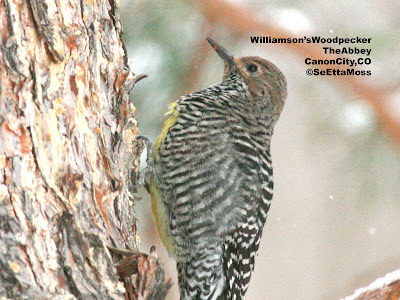 I spent some time this morning watching the female Williamson's Sapsucker at the Abbey as she fed. It was quite cold and a little snowy and she was very actively feeding in a Scots pine tree. Though the light was poor with the cloud cover, I was able to get these pics that show off her very lemony-yellow belly. Some birders who are unfamiliar with sapsuckers incorrectly think that those with very yellow-colored bellies are of the species Yellow-bellied Sapsuckers (their pale yellow,sometimes buffy, bellies are not prominent). Hummingbird with ice on tail! 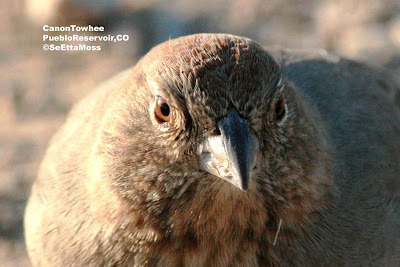 The top pic here is my favorite--it provides such a sharp view of the Canyon Towhee's eye with the pupil showing distinctly inside the brown iris and the clear pale/whitish eye ring. It's crown appears more rust than reddish as described by Sibley and others. Double-click on this pic-it enlarges even more and stays quite sharp. 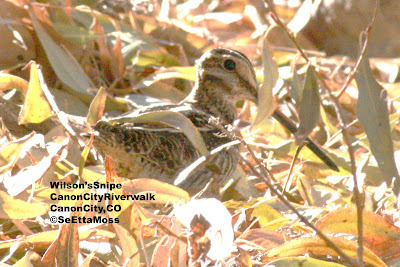 Yesterday I was in Pueblo,CO for non-birding purposes. I drove out to the Pueblo Reservoir to walk my dogs, and get a little birding fix--and it turned out to be very little birding. Though it was mid-afternoon-3 pm when I got there-the light was already starting to fade a little (this is a very big deal with super zoom camera lens as they need a lot of light) which made looking at distant gulls too frustrating. 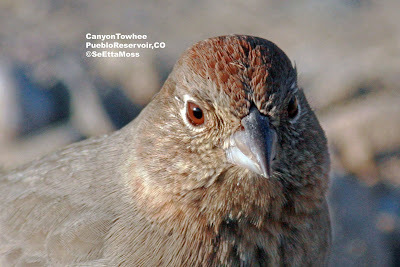 But I did find several cooperative Canyon Towhees that were more interested in feeding than noticing the click of my camera (I stayed inside my car so I didn't disturb them). I have kept the 1.4 extender on my Canon Xti with my 400 mm,f5.6 lens--with 1.6 multiplier from my camera (it's not a "full frame" camera), I have an effective focal length of over 800 mm. "Billions for a US-Mexico border fence, but is it doing any good?